I seem to be getting quite into my skincare at the moment, a week or so ago I was on the look out for something that I could use along-side my usual cleansing regime to give my pores that extra deep clean. I had obviously heard of the Clarisonic Facial Brushes, but these are quite on the pricey side so I was constantly on the hunt for a cheaper alternative. That's when the lovely people at Magnitone contacted me, asking me to join their review panel for the #7daychallenge. I researched the company/products as you do and it sounded just like what I was after! 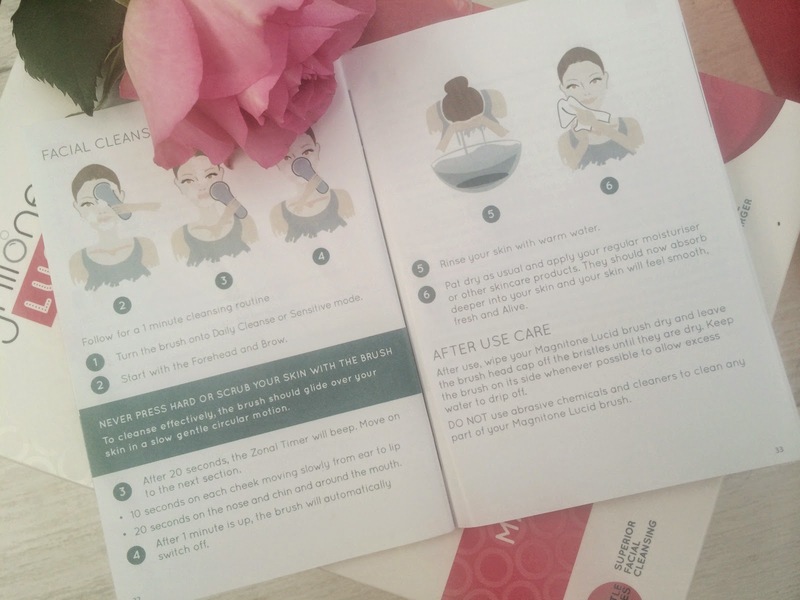 I was super excited to get stuck in as I've never used anything like this before, but also a bit nervous at the same time as my skin can be rather sensitive at times. Magnitone seem very confident with their product as they promise "softer, brighter, smoother skin in just 7 days"..lets see shall we? 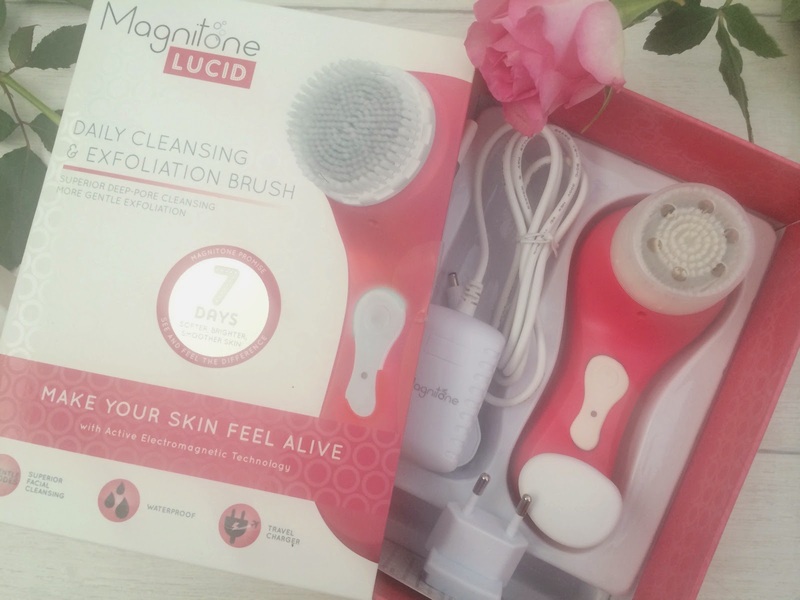 I have put together a 7 day diary on my experience with my Magnitone Lucid so you can see exactly what I thought. You can choose from 4 different colours for the Lucid model Green, Yellow, Blue and the one I chose in Pink. Inside the box comes a charger, the charger is quite unusual to me as its a magnet that you pop on the handle then connect to the plug. 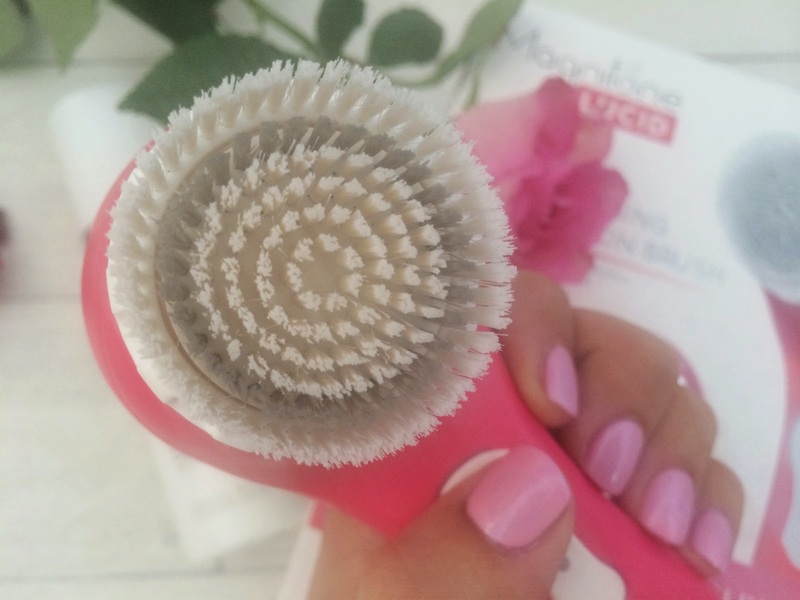 You also get another plug adaptor which is so handy if your going on holiday abroad, as well as the Dual Mode Lucid brush, Active Clean brush head with SprayGuard bristles, Full Usage instructions and a 12 month warranty card. As soon as the package came I had a good ol read of the manual it came with, I never quite realised how simple it could be. All that's to it is two modes Daily Cleanse/Sensitive, push the button once on the Lucid for the Daily Cleanse, twice for Sensitive mode then turn it off completely on the third press. 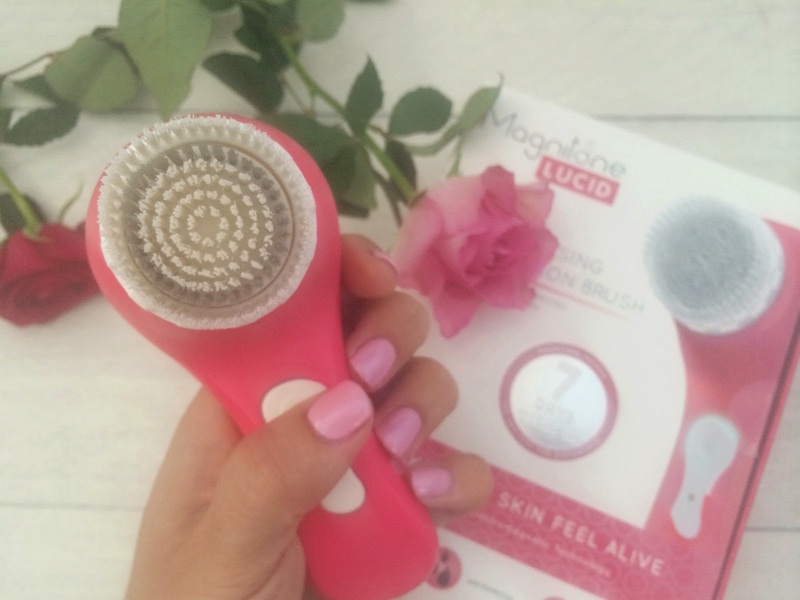 Once the Magnitone Lucid is switched on changeable brush head gently vibrates to give your skin that deep clean it also gently buffs away any dead skin to reveal that bright new layer...oh the powers of exfoliation! This little thing gives off 10,000 pulsed oscillations per minute with its special Active Electromagnetic Technology...I know right?! swish. The brush head isn't rough what-so-ever its just the right amount of firmness to feel like its actually doing something for you. Its waterproof too so you can use it in the shower and my favourite part is the timer.. its brilliant, I start on one cheek using it in light circular motions hear the beep, move on to the other cheek, then the next beep comes and I move to the forehead; it then switches itself off for you and your done...easy peasy! this facial brush literally does all the hard work for you. It also comes with a little brush head cap to keep everything more hygienic, just be sure to only pop it on once the brush is dry to prevent moulding. Here is how I got on and my thoughts for the first 7 nights of using it..
Day 1- I started by taking off all my makeup first by using a hot cloth cleanser, I did this first because I didn't want to get my lucid brush all dirty. I then filled up my sink with warm water splashed my face with it, then dipped in the lucid to get the brush wet (this just provides a bit more foam with my cleanser). I put on a few pumps of my Alpha H Balancing Cleanser on the brush head and pushed the button once on the lucid for the Daily Cleanse setting and got to work. At first I thought it was a pretty strange feeling because like I said I've not used anything like this before, I quickly realised I didn't need so much pressure on it too. My first impressions where great, when I rinsed off my cleanser my skin felt baby soft and thoroughly clean like never before..it seriously felt amazing!.plus I loved how the shape of the Lucid fits perfectly into the palm of your hand. I experienced no sensitivity at all, just make sure not to use it on inflamed/broken skin as that wont be to pleasant (that's just common sense thought ha!). 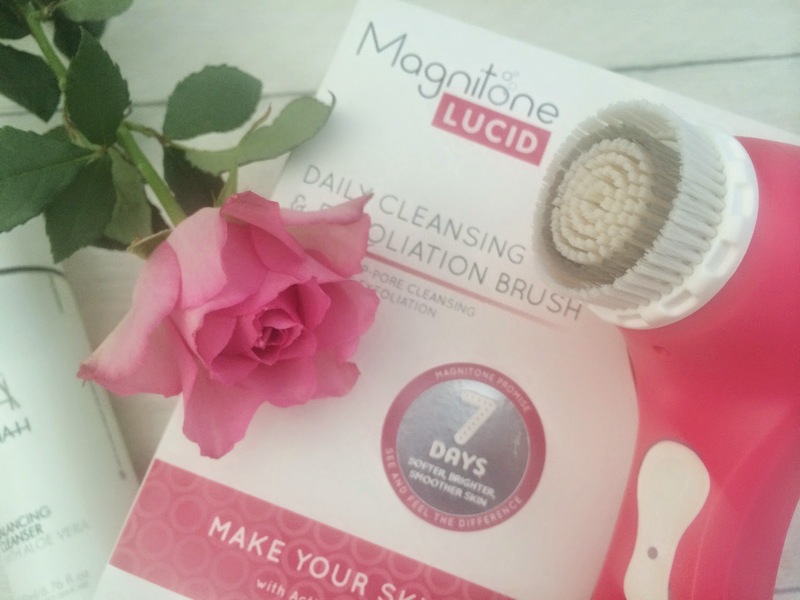 Day 2 - I seem to be looking forward to taking my makeup off today for a change, this Magnitone Lucid is making it much less of a chore, I just love how it made my skin feel the night before. I also noticed that my makeup went on so much better today. Day 3 - I have still been following the steps as day 1 but instead of pumping the cleanser onto the brush I decided to put it on my face instead, I just thought that this would distribute the product more evenly on my face. I think I prefer doing it that way. Day 4 - I started to notice quite a bit of difference to my skin already, it appeared to be a lot more brighter and softer. Day 5 - No breakouts for days since I've been using this and that's quite unheard of, plus I have hardly any blackheads and my pores look slightly smaller. Day 6 - Much to my surprise and complete joy, I have noticed that my acne scars are a lot less prominent and my skin tone is so much more even. Completely amazed! I wasn't expecting this all from a facial brush what-so-ever. Day 7 - I have never been confident with my skin, as a teen I was having constant breakouts that I needed to go to a doctor for, then as I got older it got better but I was left with some scaring. You would never have caught me without foundation in a millions years, it just gives me the confidence I need...until now. Hand on heart, when I look in the mirror now at my makeup less face I don't feel embarrassed at all, my skin looks and feels so amazing, so much so I can actually go out and about with just a bit of concealer on, this is completely unheard of for me and shows just what an amazing bit of kit this Magnitone Lucid really is. Magnitone have totally lived up to their claims in my eyes, and I am truly thankful at what wonders it has done for me, this is probably going to sound slushy to some but I really feel this has given me some much needed confidence back. Even family members have commented on how good my skin looks recently. As for the charge on this, it is still going strong, ive used it for 9 days straight now and still haven't had to charge it. Visit Magnitone and find out more here. 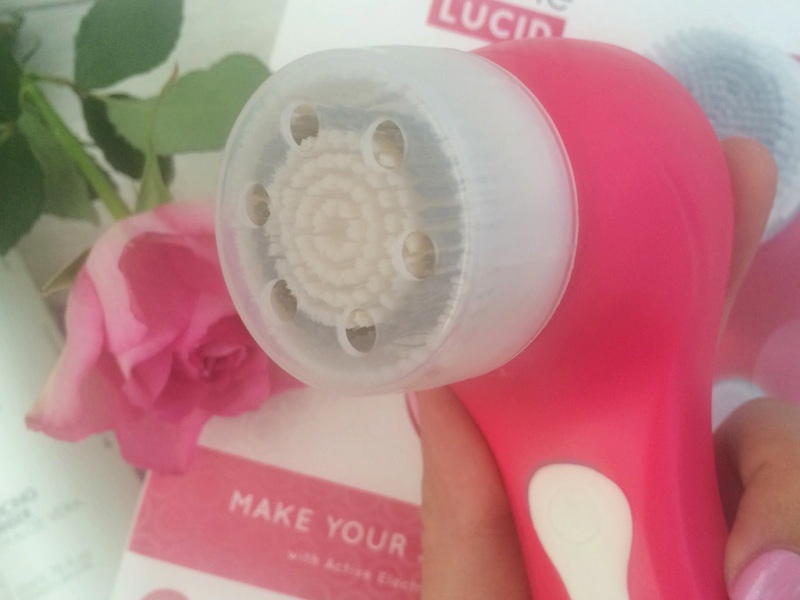 Do you own the Magnitone Lucid? Is this something you're interested in? I would love to hear your thoughts. oo I'm so jealous you got to try this. I so want it but just can't afford atm. I really need to get my hands on one of these to sort out my poor skin! I need! !